It was the second week of November when we came to do our part in the project. 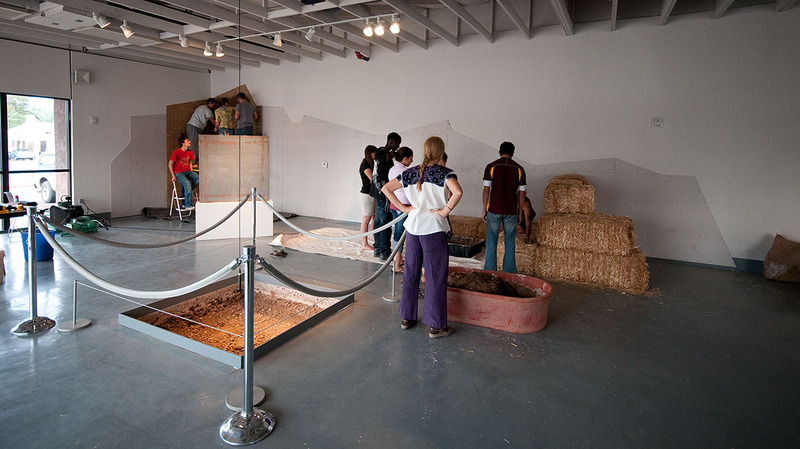 The Post Commodity group had cut a 4×4 ft hole in the concrete floor of the museum and stood it upright on a pedestal. There was an audio recording of a Pee Posh social dance performed by the collective. We never met any members of the group or discussed with them anything about the meaning of what they had done. We went for what was probably the simplest interpretation – cutting through the concrete floor to get back to the earth below. Athena’s aunt Nora had created a series of clay and fabric sculptures that she called “Pods” that represented elements containing seeds or growth producing elements. We made no attempts to deepen our understanding what had happened before us and went to work. When we viewed these pieces within the rather stark empty space of the museum, there was a feeling of emptiness and separation. It was not a warm and inviting environment by any means. 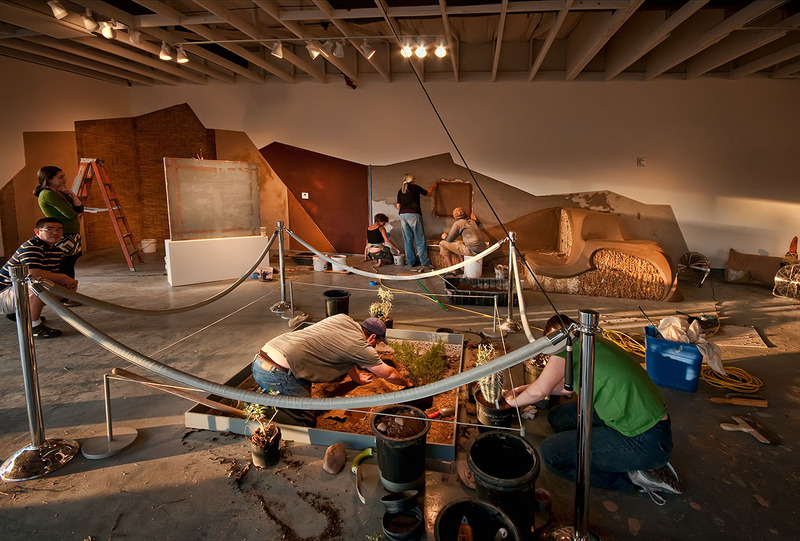 The impression that came to us was that of two different artist groups having done their work each independent of the other. We never actually vocalized it, but I think all us including Athena, our son Benito and his girlfriend Ariela assumed that our job was to weave a thread of connection between all the pieces and to make the overall space more inviting and interesting. 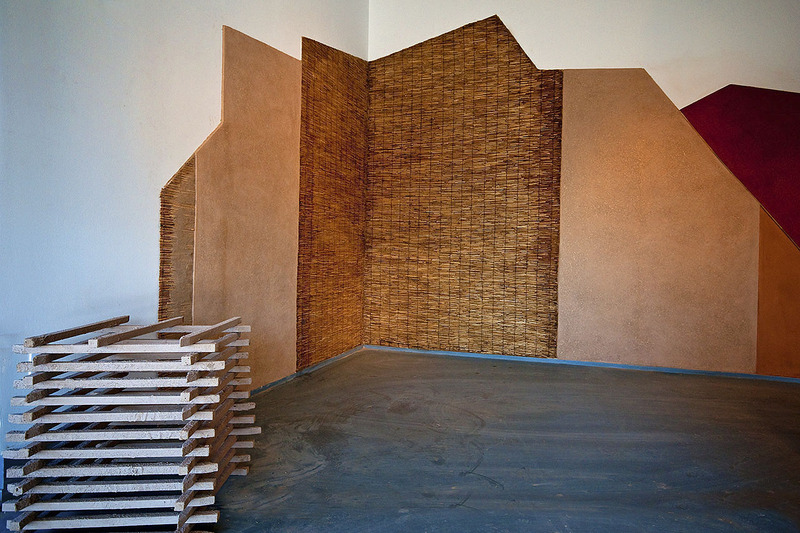 The room at the Ceramic Research Center when we began. Typical of how we work in most environments, we didn’t have a very clear idea of what we were going to do. We lined up the materials that we envisioned using – clay, chopped straw, bamboo poles, reed mats, straw bales and a new element we haven’t used before – straw wattles, that are typically used for erosion control. Peter Held, curator of the Ceramic Research Center where we worked, was a great help in acquiring what we needed. Even better for us was that curator Peter Held didn’t seem worried when I told him that we really wouldn’t know what we were going to do until we arrived. Perhaps this was somewhat due to after 20 years of working together, there is a shared intuitive understanding and confidence that continues to grow between Athena and I when we are working together that is communicated to those around us. One thing was somewhat certain, much of our work takes place on walls so it seemed obvious to us that we would have to do something to the walls. The only requirement was for us to put up a buffer between the existing walls and whatever we would do. This was most easily done with another layer of drywall over the existing walls. We almost never work with so it was a challenge to make it fun rather than drudgery. In the interest of being somewhat whimsical and for visual interest we cut the tops into angular patterns of different heights. Over a small section of newly installed drywall we installed reed mats filled with clay and left the remaining areas for a sampling of different colored clay plasters. The beginnings of our work with a group of students from the Orme school. The other thing that seemed to be missing was a place to sit and absorb the setting. If there is anything Athena seems to like to do it’s making places to sit. 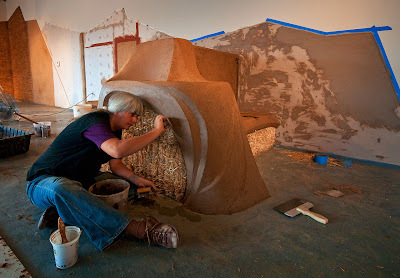 Without so much as a brief pause, she snapped up the opportunity to sculpt a beautiful clay design over a grouping of straw bales. Over a day three day period she remained glued to that project. 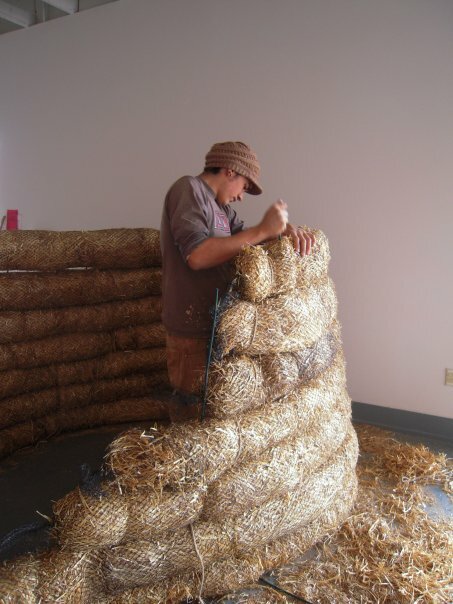 Benito and Ariela building the straw bale bench. Athena detailing the clay and straw plaster. 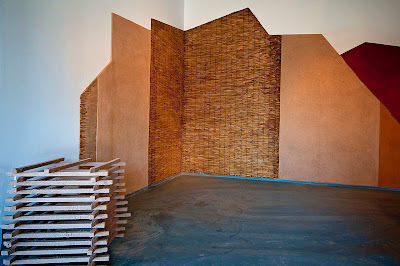 The rest of the walls are a sampling of different clay finishes. One accidental piece happened in the closing moments of the last day of work. 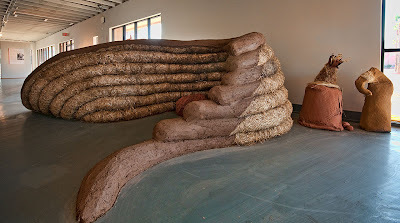 We had put a square of burlap in the center of the walls which when everything else was complete, it became obvious that it just wasn’t working and we needed to do something with it. 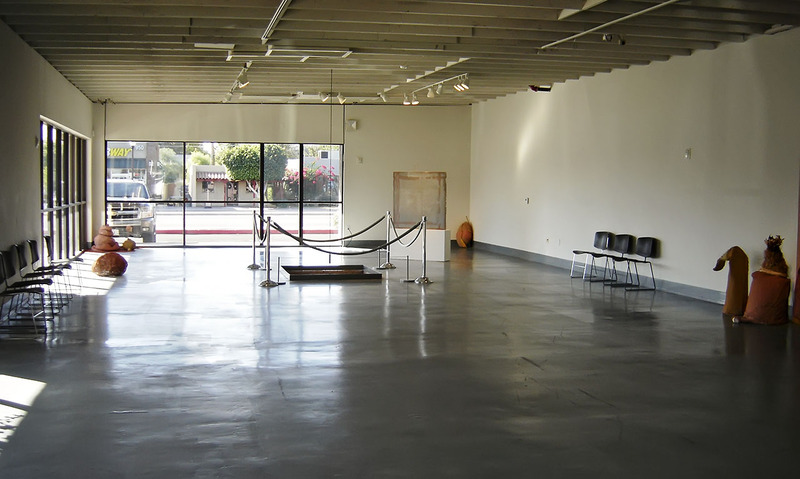 Out of desperation we decided to pull it off the wall, the great surprise was the drywall below mimicked the concrete slab that had been cut from the floor both in dimension and color. Seemed an appropriate coincidence so we left it as it was. 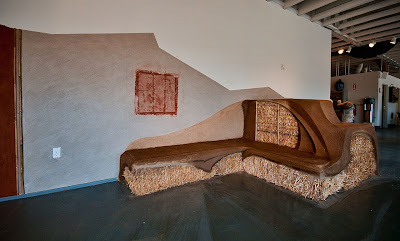 Front of the straw bale bench and drywall where burlap had been removed. We had requested seven twenty five foot long straw wattles that are typically used for erosion control with no clear purpose in mind other than shaping them into some interesting configuration. At first images of nests, baskets, domes and the like came to mind, but given the tools at hand and the time constraints, we basically left the wattles to arrange themselves in a shape that seemed to fit their make-up. It wasn’t until the last day that we attempted to do anything with them and by then, all of us were busy finishing different segments of the installation. We engaged in some initial dialogue with museum curator Peter Held and once we had some agreement, turned the job of the wattles over to him who worked in concert with his son Matt, Benito and our nine year old Kalin. 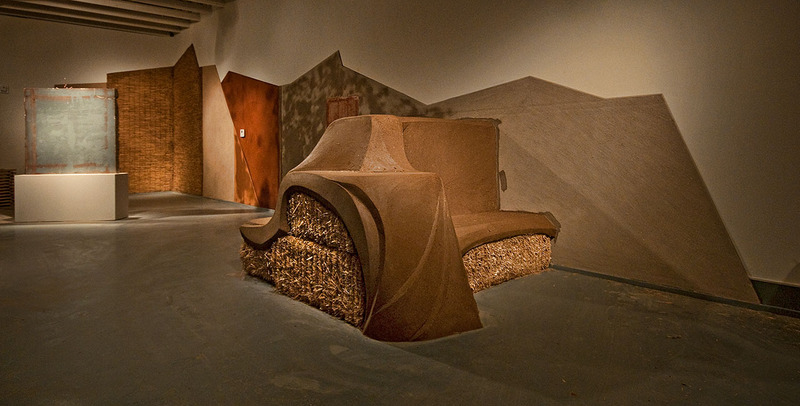 Wattle sculpture with Nora Naranjo Morse pods to the right. Wattles as viewed from the front door entrance. The wattles had come with wooden stakes, but they proved too large for connecting them so Kalin took them, painted them with clay and turned them into his own sculpture. Kalin’s clay painted wood stakes sculpture. Another final piece that happened on the last day came about when our friends Joe and Rebecca Ewan, professors in ASU’s Landscape Architecture department, transformed the ground contained within the square where the concrete slab had been removed. Since the moment we had seen the empty space we felt the need to take it one more step and bring it alive with plant life. 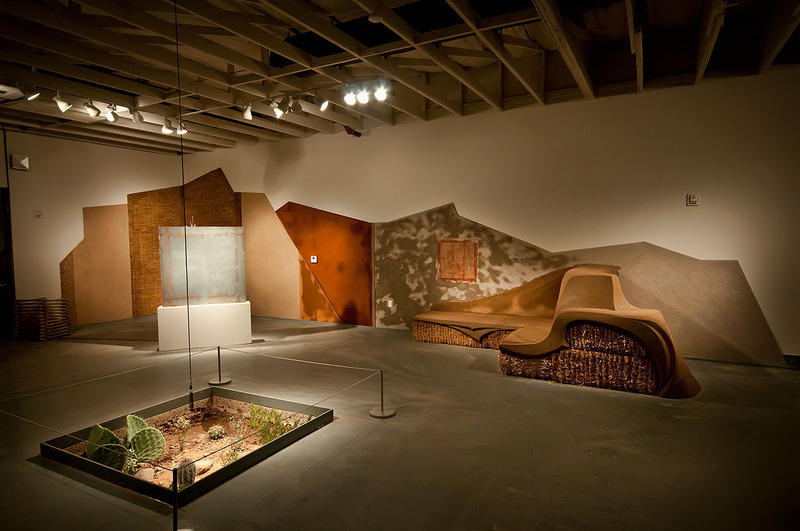 Almost magically they transformed it into mini replica of the Sonoran Desert landscape. Given our early interpretation of the empty hole, that of returning to the earth, the natural thing to do seemed to replace the vegetation and make it come alive. 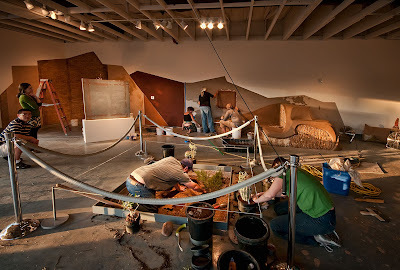 The group at work with Joe and Rebecca Ewan installing Sonoran Desert plants. As we finished the evening of our last day. Splotchy walls are from the plaster drying. Looking back on our work last week, it seems almost magical how it came together. Our discussions consisted of brief moments of getting agreement between us all on such things as how to cut the angles of the sheetrock, how much reed to use, how to shape and construct the straw bale bench, what color and texture to make the plasters and how the new desert landscape would look. Everything moved fast with little deliberation. 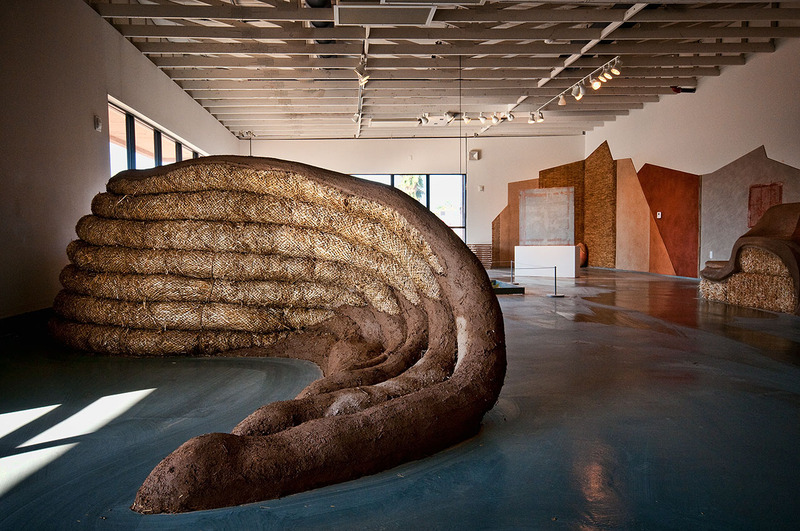 When all was said and done, the exhibit as a whole felt really marvelous, everything seemed to have a place. Athena’s aunt Nora’s pieces, that earlier had seemed without home, we comfortably nestled into corners and curves of the new environment. Twenty years ago when we first formed The Canelo Project, we coined the phrase “connecting people, culture and nature” to describe what it did. For us, our part in this installment seemed to make that phrase truly come alive. Gorgeous stuff! Athena is magic.